Oh, Slenderman, you tall, many tentacled, paranormal figure with no face in the back of old photographs. Despite your sordid history, I find you inspiring. Your stark white featureless face shines like the moon above the inky blackness of your crisp suit. 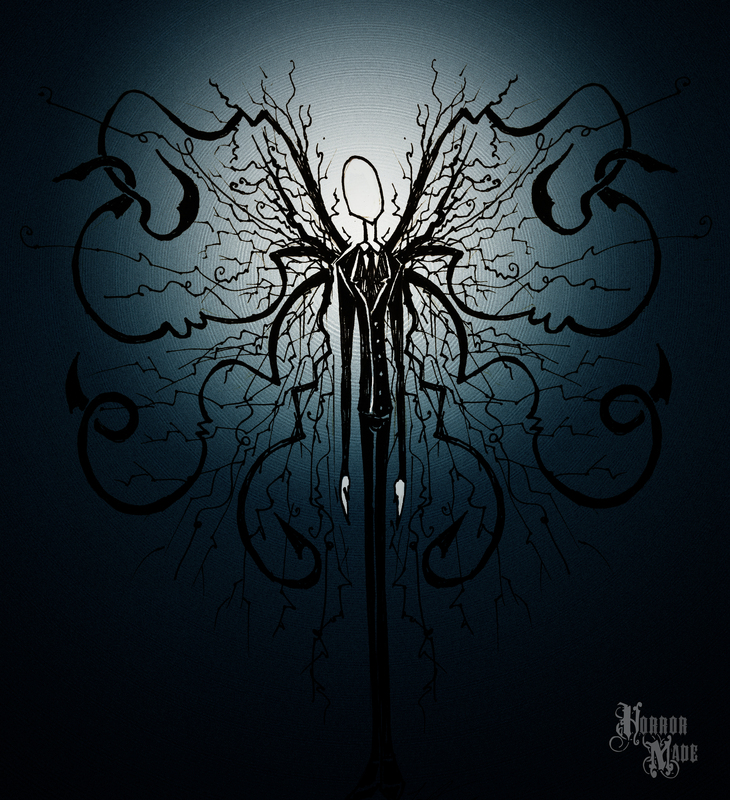 Oh, Slenderman, you infamous internet character who inspired dumb kids to do terrible things. Although there was that one incident that drew your name from the dark corners of cyberspace, I choose to ignore it from this point forward and explore the lore you have built around you. Besides we should all know by now, you can’t trust anything you read on the internet. And you can trust me on that. Why suddenly focus on Slenderman? Well, three main reasons. 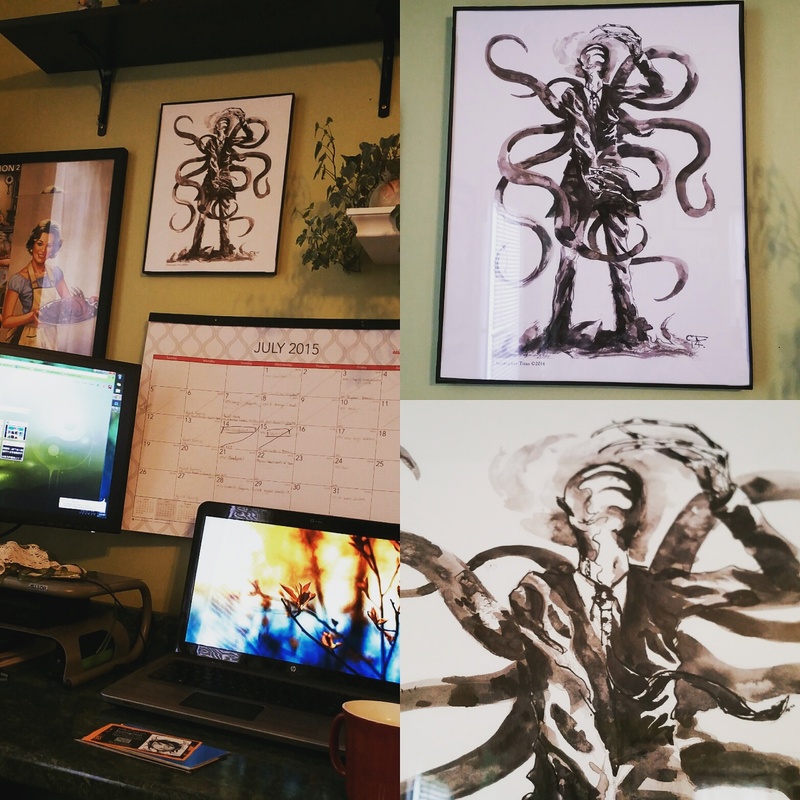 Because I’ve been staring at this amazing Slenderman ink print by Christopher Titus. 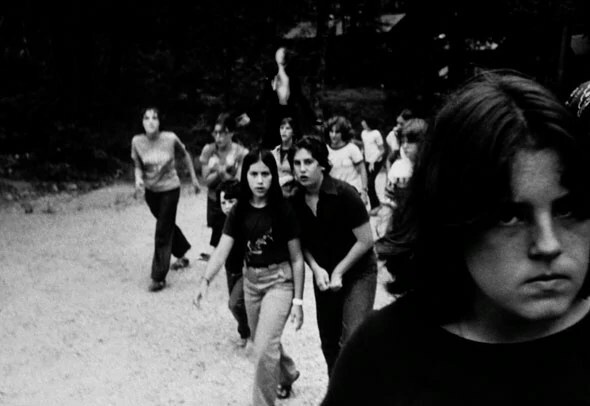 Slender Man appeared first on the Something Awful Internet Forum, in a thread about making creepy images in photoshop. The image you see to the right was Slenderman’s first appearance ever, and it was created by the forum poster, “Victor Surge” aka Eric Knudsen. According to the Slenderman Wikia and my jaunts through the forest while being stalked by his eerily floating and flickering shadow, He is rumored to only target children (guess I still count.) and is most often found lurking in the woods of suburbia. He seems to revel in stalking people and allowing them just enough of a glimpse to spike up their fear. Now that Slender has become our generation’s boogie-man he’s swiftly filtered his way through art, stories, and film. My favorite iteration is definitely The Silence from Doctor Who. What is your favorite paranormal lurker? Shadow people? Reptilians? Ghosts? Something new all together? Leave me a comment and let me know. Two Sentence Story Tuesday Transforms!